Freedom and Flourishing: Does capital deepening reduce labour's share of national income? Does capital deepening reduce labour's share of national income? The share of wages and other labour remuneration in national income has been declining in most high income countries over the last few decades. I have previously argued that if we are concerned with the well-being of the poor, we should be more concerned about trends in real wages than about trends in the distribution of income between labour and capital. That is still my view, but it hasn’t stopped me trying to understand the reasons why labour’s share has been declining. My interest has been aroused, in particular, by the claims of some researchers that capital deepening (increases in capital per unit of labour) have contributed to the decline in labour’s share of national income. For example, the OECD’s Employment Outlook 2012 provides the following answer to the question: What explains the decline in labour’s share? “Total factor productivity (TFP) growth and capital deepening – the key drivers of economic growth – are estimated to jointly account for as much as 80% of the average within-industry decline of the labour share in OECD countries between 1990 and 2007”. The message that seems to be giving is that if a country or a region has the institutions, people and natural advantages needed to attract substantial additional investment, don’t expect the associated capital deepening (increase in capital to labour ratio) to have a strong positive impact on demand for labour. There are some circumstances where that might be a reasonable proposition. For example, as Dean Parham has shown in work for the Productivity Commission, the growth of the capital-intensive mining sector in Australia during the 2000s was strongly associated with the decline in labour’s share of national income over the same period. However, the circumstances of Australia’s mining boom are somewhat peculiar. If it is generally true that capital deepening doesn’t have a strong positive impact on demand for labour I might need to make some fundamental revisions to my views about how economic systems work. Dear reader, the next few paragraphs are somewhat abstruse, but please bear with me because I need your practical wisdom about production technology and the elasticity of substitution between capital and labour. The elasticity of substitution between capital and labour is the critical factor determining the impact of capital deepening on demand for labour. It can be defined as the percentage change in capital deepening for a 1% change in the ratio of the wage rate to the rental price of capital (making the standard assumption that factors are paid the value of their marginal products). 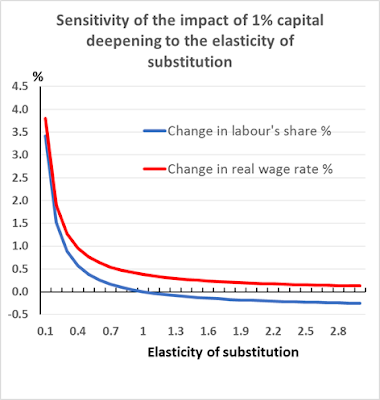 The sensitivity of the impact of 1% capital deepening (a 1% change in the capital to labour ratio) on labour’s share of output and real wages is shown below (assuming labour’s share of national income is 62%, the median for OECD countries). The graph is drawn under the assumption of zero technological change. The underlying equation for percentage change in labour’s share is Equation 3 of Robert Lawrence’s recent working paper for the Peterson Institute on the decline in labour’s share in the US. The equation for the change in real wage is as derived in the end note below. The OECD’s assertions about capital deepening reducing labour’s share were backed up by what appears to have been a fairly sophisticated econometric study by Samuel Bentolila and Gilles Saint-Paul (published in 2003) subsequently updated by OECD staff. These analyses suggest that capital and labour are gross substitutes (i.e. the elasticity of substitution between them is greater than 1) and attribute the decline in labour’s share to both capital deepening and capital augmenting technological change (i.e. technological change that has an impact similar to adding more capital). However, other econometric studies suggest that the elasticity of substitution between capital and labour is less than 1. For example, Robert Lawrence’s recent analysis of the decline in labour’s share of US income provides econometric evidence that it is attributable to technological change being so strongly labour augmenting (labour saving) that it has more than offset the positive impact of capital deepening. His results suggest that as a result of technological change “effective capital-labour ratios have actually fallen in the sectors and industries that account for the largest portion of the decline in labor share in income since 1980”. I will leave it to others to attempt to unravel the mysteries of these conflicting econometric findings. It probably makes more sense for me to focus here on considering which set of results seems more plausible in terms of what you and I know (or think we know) about production functions at the level of the individual firm. Think of any firm in any industry. In order to keep the analysis simple, assume that the firm leases the capital equipment that it uses and that the firm is small enough not to have any impact on either the rental price of capital or the prevailing wage rate. In the hypothetical situation I want you to consider there is no potential to change technology, only the potential to vary the amount of equipment or labour that is hired (and to vary other inputs in proportion to output). Now, consider to what extent the ratio of capital to labour is likely to change if the rental price of capital equipment declines by 10%, thus causing an increase in the ratio of the wage rate to the rental price of capital. The answer that some readers may come up with is that the ratio of capital equipment to labour is fixed by existing technology, so that it will not change even if output changes in response to the lower input costs. For example, there is not much point in having more taxis than drivers or more desk-top computers than staff to use them. That corresponds to Wassily Wassilyevich Leontief’s assumption that the elasticity of substitution between capital and labour is zero. The assumption of zero substitution possibilities is too extreme in my view, but I can’t think of an industry where it would be reasonable to expect a change in the wage rate to rental price of capital ratio to result in a more than proportionate change in capital deepening. Perhaps the time is approaching when firms will be employing both driverless vehicles and human-driven vehicles, so a decline in rental price of driverless vehicles could easily displace humans. But I don’t think that time has yet arrived. (Of course capital equipment can often be substituted for labour by introducing new technology, but the elasticity of substitution relates to unchanged technology.) Perhaps these comments just reflect the limits of my experience. Please enlighten me if that is so. My bottom line is that unless I am persuaded otherwise I will cling steadfastly to the belief that capital deepening normally tends to raise real wages and labour’s share of national income, and that the decline in labour’s share of national income in high-income countries is attributable to labour augmenting technological change. where W is the real wage rate, Ϭ is the elasticity of substitution between capital and labour, g is the rate of labour augmenting technological change, Y is output and L is labour input, so Y/L is average labour productivity. where SL is labour’s share of output, K is capital services, h is capital augmenting technological change, if we assume constant returns to scale and Euler’s theorem.